Modista is a neat way to look at shoes and stuff. Generally: browse by clicking on items that interest you. 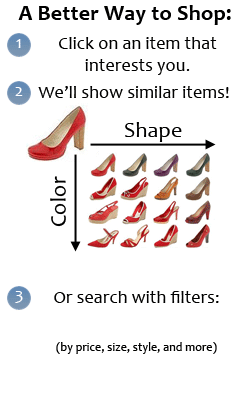 We'll display similar color and shape varieties so that you can explore related looks, along with filters that can refine your search. Technically: Modista indexes Web-scale product inventories with image processing, in addition to text metadata. Speedy algorithms generate the patented grid interface in real-time. Historically: Arlo Faria and AJ Shankar built this at Berkeley. Due to anti-competitive patent litigation, we got shut down in 2009. That's now over -- thank you, Google -- so we're back! Shop our retailers' best deals right here on Modista! Have an idea about what you want? Alternatively, contact us directly at feedback@modista.com. You can use your browser's back and forward buttons to review earlier items and create bookmarks. Or simply add items to Favorites as you go. They'll be saved for future visits, and can be shared with friends via email or a link. You can actually type all kinds of stuff into the Quick Search box, such as "size 10 white asics gel kayano" or "waterproof hiking boot". Suppose you find the perfect item -- but it's too expensive. Adjust the price sliders in the Refine By > dialog to display only similar-looking items that are within your budget! Resize your browser window for optimal viewing. We'll display as many items as can fit in the window. No more scrolling! Favorites getting full? Simply email them to yourself ("Share Favorites!") to keep them permanently. Please leave us some feedback via the Help menu! Copy this link and email it to a friend, share it on a social networking site or message board -- your call! To send to multiple friends, enter their addresses above, separated by commas. Hey, check out what I found at Modista! Select a sharing method above. Remove recommended items that you don't like by clicking on the . We'll add the rest to your Favorites list.